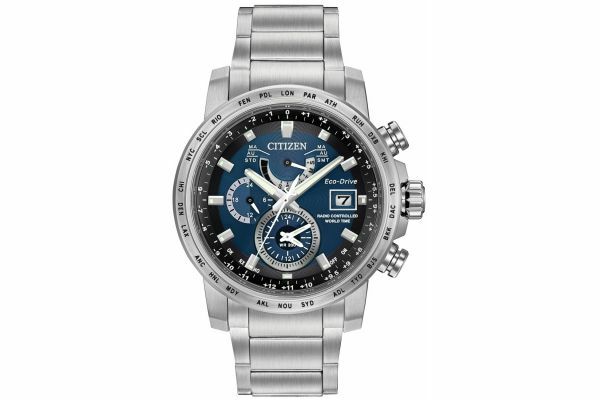 Men's Citizen World Time A-T stainless steel sports chronograph watch with a round brushed case with city abbreviations. Has a blue dial with large silver batons, date display window and three sub dials. Features an all brushed stainless steel bracelet with fold over clasp. 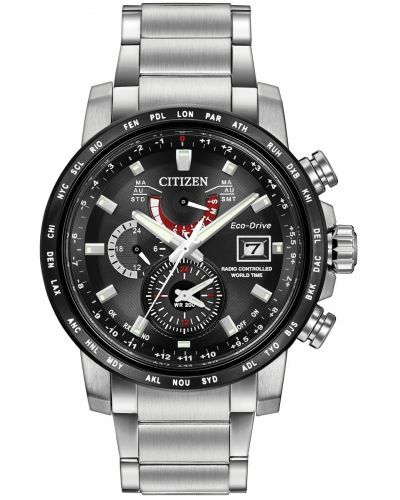 Powered by the famous Eco-Drive Solar movement and comes with the Citizen 5 year guarantee. Citizen World Time A-T AT9070-51L. For us to size your new Citizen World Time A-T watch as accurately as possible, please take a look at our downloadable Watch Sizing Guide.